Read on for an in-depth exploration of the state of LGBT Charlotte — both positive and negative — and how the convention could help our city move forward. First, I should say I think it would be wonderful to have the Democratic National Convention hosted in Charlotte, or anywhere in North Carolina. There are plenty of reasons to support Charlotte’s bid for the event: the positive economic impact, Charlotte’s chance to shine bright on a national and international stage, the opportunity to showcase our city to prospective businesses and new citizens, and more. But, putting personal, state and city pride aside, we shouldn’t pass up this opportunity to actually take a deep and long look inward and ask ourselves: Has Charlotte made any measurable or acceptable progress on its path toward being a truly “world-class city” where LGBT citizens and residents have full equality and are treated with their full dignity and respect? The answer is simple enough, really. No. 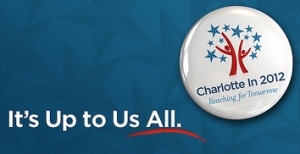 Charlotte is not a city where all citizens are treated, respected, integrated or celebrated equally and with dignity. Charlotte is not nearly as progressive nor inclusive as other recent convention host cities. Two weeks ago, I compared the Queen City and the three other potential host cities on several LGBT issues: Charlotte came in dead last. The Queen City is no hospitable place for LGBT people; it never has been and LGBT people continue to face hostility from public, private, social and religious spheres. Official protections for LGBT city workers are slim, and city officials rarely speak out on the LGBT community’s behalf. Area “leaders,” including members of city council and the Mecklenburg Board of County Commissioners, take no pause when spouting harmful and demeaning anti-LGBT rhetoric. The city’s conservative nature — perhaps, most infamously embodied by the 1996 “Angels in America” controversy — continues to plague relations between LGBT citizens and city/county government and creates a political and social environment wherein elected officials (and I’m not just talking about Bill James) can use derogatory slurs and stereotypes about LGBT people with near immunity and little-to-no reaction from other elected officials or local LGBT community leaders (here, here, here and here). The city’s and surrounding area’s anti-LGBT religious right are among the most zealous and hateful across the entire Southeast. Street preachers, “ex-gay” ministries and a slew of other groups routinely terrify and harass our city’s LGBT citizens. All the while, city officials stand by and rarely, if ever, intervene. For years, members of the largely Democratic Charlotte City Council have promised the LGBT community an inclusive non-discrimination policy and domestic partner benefits. For years, those same elected officials said they’d be more than willing to help make the change, but that it just wasn’t feasible because Republican Mayor Pat McCrory would simply veto it. We bought their empty promises time and time again. We handed them our money and our votes time and time again. What has our blind support gotten us? An incomplete, impermanent policy that can be changed at any moment by any current or future city manager. Where were those elected officials, who said they were our friends, once McCrory was gone? When there was no more obstacle standing in their way, why didn’t they have the “courage” to bring up the matter at a council meeting, and create a more permanent, inclusive change? After all, they’d been so supportive for years and years before. According to papers filed with the court, [Anne Marie] Clukey claims that her supervisor Karen King passed her over for a promotion and that she became “hostile” when she found out Clukey had undergone gender reassignment surgery. City attorney Mac McCarley said the city will not take responsibility in the case. “Transgendered individuals do not have any rights under the federal employment discrimination laws,” he told [The Charlotte Observer]. In April, when a transgender Charlottean was shot and killed at her home, city police failed miserably when speaking to the press. They held a press conference to which no LGBT news-media outlets were invited and at which police detectives referred to the victim as a “crossdresser” who lived an “alternative lifestyle.” The derogatory language made its way into mainstream media reporting of the crime. 2. Although mainstream media were invited to the press conference, this city’s only functioning LGBT newspaper wasn’t invited. There was no opportunity for LGBT journalists to ask appropriate follow-up questions and get important clarification about the victim before the mainstream media ran inaccurate, and some would say offensive and sensationalistic, news reports. 3. Reporters with WCNC and The Charlotte Observer simply repeated what they’d been told by police and family. Terms like “crossdresser” and “alternative lifestyle” made their way into the news. Like police, media referred to the victim as a man and failed to honor the victim’s gender identity. 4. Because of the vagueness of the reports, and because of LGBT media’s exclusion from the original press conference, our community was left to wonder: Have police reached out to the LGBT community? Have they sought advice on this matter? Have they spoken to Alston’s LGBT friends? 5. Most importantly, police said the crime might have been a robbery. They don’t have much evidence to suggest a real motive, and also said they didn’t have evidence Alston’s gender identity played a role in the crime. Again, the LGBT community was left to wonder: What if Alston’s gender identity was a motivation in the killing? What if this was a hate crime? The initial handling of the Alston murder case isn’t the first time concerns over LGBT treatment have been raised with the Charlotte-Mecklenburg Police Department. Party Chair Joel Ford and former Mayor Pat McCrory appeared on WCNC’s weekly broadcast of “Flashpoint,” a local “Meet the Press”-like politics and current affairs program, on Sunday, Feb. 6. Anchor Dave Wagner asked both men about their views on DADT and the current push for repeal being heard by the U.S. Senate Armed Services Committee this month. McCrory said military commanders calling for repeal were “doing what their boss says” and called the discussion “divisive” as the nation continues to fight two wars in Iraq and Afghanistan. In follow-up conversations with qnotes, Ford admitted his comments were likely the result of not knowing much about DADT. Provided fact sheets and other figures, Ford said he had a better understanding of the issues. No doubt, the list of “cons” is pretty long — much longer than any list of positives — but there are good things happening, even if so very slowly, for LGBT people in the Queen City. Despite the city’s conservative nature, Charlotte’s local LGBT community is strong. Putting aside arguments or concerns of how the community can improve, let’s just take a look at what exists now. We are one of only two North Carolina cities with an LGBT community center. Founded in 2000, the Lesbian & Gay Community Center of Charlotte is now the oldest such center in the state. The Center’s leadership partners with several community organizations to raise awareness. Recently, the Center attended a community function sponsored by the Mecklenburg County Department of Social Services, wherein the Center chair described meeting some who were not yet aware the city had an LGBT community center. Charlotte-Mecklenburg is one of only two local areas with an LGBT-related political action committees. The Mecklenburg Gay and Lesbian Political Action Committee (MeckPAC) endorses local city and county candidates each election season and lobbies them for more inclusive policies when not in election mode. Last fall, MeckPAC partnered with the Center and the Charlotte Business Guild to host a reception for local candidates where the group celebrated an important, albeit only a symbolic, milestone as both the Democratic and Republican candidates for mayor attended the event — a first for the group and the city. The Charlotte Business Guild has forged new and unique partnerships with other community organizations, including the mainstream Charlotte Chamber of Commerce. The Queen City is home to one of the oldest and largest LGBT youth service organizations in the Southeast. Founded in 1993, Time Out Youth offers emotional support, peer counseling, social opportunities, emergency youth housing, college prep, and an annual scholarship program for graduating high school seniors. Recently, Time Out Youth was able to assist in the creation of a similar youth services program in Memphis, Tenn.
Our annual Pride festival, Pride Charlotte, is among the largest in the state, attracting as many or more participants and attendees as the statewide NC Pride Fest in Durham. The Queen City also plays host to the annual Charlotte Black Gay Pride. Both events shine a much-needed spotlight on LGBT citizens and together attract at least 15,000-20,000 attendees each year. Charlotte is home to qnotes, my employer and the state’s oldest LGBT publication still in operation. Both Bank of America and Wachovia/Wells Fargo have fairly active LGBT resource or affinity groups. Those LGBT corporate associations have been involved in community-based fundraising and other activities. For the most part, Charlotte’s social, entertainment, nightlife and dining scenes are LGBT-friendly, even if the political and larger social atmospheres are not. The popular Takeover Charlotte has introduced straight-owned restaurants, bars, lounges and clubs — as well as several museums and other art facilities — to the city’s LGBT community. Charlotte is home to two large LGBT nightlife establishments (Scorpio, Closet), five other LGBT nightlife establishments and one lesbian-owned restaurant/bar/club popular with an even mix of LGBT and straight customers — the largest number of LGBT nightlife establishments in the state. If, by chance, Charlotte is chosen to host the 2012 convention, what might the city have to positively gain for its LGBT community and how could it move our city forward? LGBT party activists, donors, candidates and elected officials would be among the 35,000-plus convention visitors. Along with them would come their partners and spouses, other LGBT friends and colleagues and strident straight allies. These LGBT convention attendees and delegates would stay in local hotels, see local attractions, eat at restaurants, relax at area nightspots and more. Their presence here would bring a significant influx of positive, LGBT awareness — something desperately needed in the Queen City. Further, the convention would give these LGBT attendees the chance to highlight national LGBT issues on a local scale. Similarly, local LGBT issues could be highlighted nationally, discussed and reflected upon. The local LGBT community would be given the chance to highlight our own achievements and successes (however small they might be). The convention might also give us the inspiration we need to continue fighting for full equality, respect and recognition in local government. Hopefully, that same inspiration might push local Democratic leaders to stand up with real political courage and advocate for full equality. In short, Charlotte needs the Democratic National Convention: the attention it brings, the people it brings, the party activists and insiders it brings, and especially the LGBT delegates, candidates and elected officials it brings. No doubt, the convention might bring to the Queen City more openly LGBT, politically-active and -aware people than we’ve ever seen here. All of this will combine to make our beloved city better and more inclusive of all its citizens, regardless of sexual orientation and gender identity. Reyes- that’s who I was thinking of that Meck Deck mentoned. Do you agree with what he said about that maybe causing a rift? I don’t see why it should. One man should not stain the entire community.